Buying a cooking appliance is a major kitchen investment, but most people find that they get more value out of their range cookers than they ever did out of their normal size freestanding cookers. Within a relatively compact kitchen space, ranges offer loads of versatile cooking space. Because they can have up to seven hob burners and four or five ovens/grills, they are perfect for large families or keen home cooks. Induction ceramic cooktops use the latest induction technology in order to heat up pans directly, minimising heat wastage. These hobs look very smart and are becoming increasingly popular and many range-cookers are now coming out with induction hobs instead of the traditional gas ones. Arguably, they don’t give you the traditional range look though. But in terms of ease of use, they completely trump the other options. This electric range cooker with induction hob from Rangemaster is the perfect choice for a household that needs to cook more than one dish simultaneously or like to have guests over. With 2 large oven cavities, one an electric fan oven and the other multifunctional, 5 burners, a separate grill and even a slow cook oven at the bottom right of the cooker, this Rangemaster creates a cooking experience like no other. We love the rack attached to the oven door, making cooking a joint of meat hassle free and much safer to remove from the oven, but our favourite feature has to be the pan detection on the induction hob. The top even concentrates the heat onto the base of your pans so no energy is wasted, and when turned off after cooking, the residual heat indicator warns you that the surface is still hot. A little on the expensive side but all the features are worth the extra spend! Whether cooking for guests or just yourself, this Rangemaster will create a cooking experience like no other. For those who love gadgets on their appliances, this could very well be the range for you! Manufactured in the UK, this is a fully electric range with glass induction hob. In our opinion, that makes it a standout already. This lovely electric range is energy efficient and compact. The glass induction hob has five heating zones and the oven comes with easy glide telescopic shelves (which make them burns safe for any busy households). You’ll also avoid spilling anything or the dish tipping out. The grill is separate, so you don’t have to juggle between the two when cooking a big meal. In all, there are three cavities, so you don’t have to disturb the casserole in order to bake the after-dinner cupcakes. 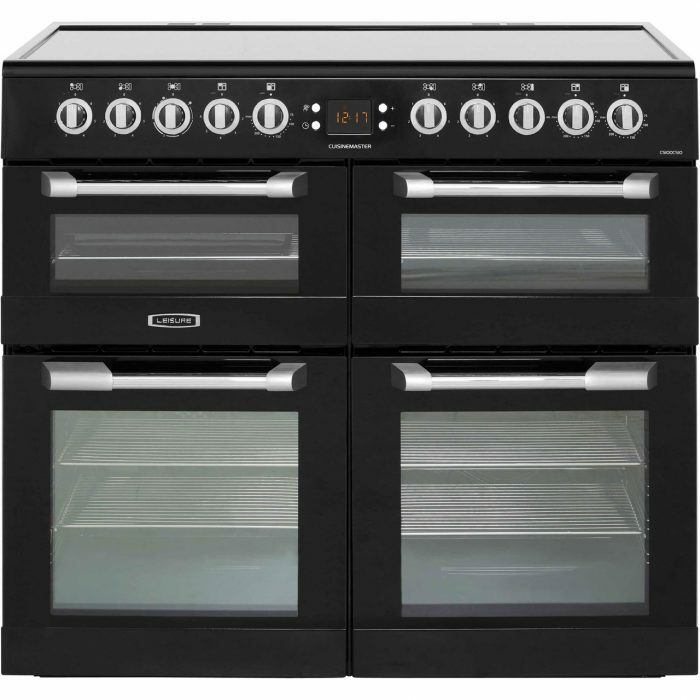 This is a quality range cooker, which will be guaranteed to please any busy home cook. It is also really quiet, so will not disturb your meal time or socialising. The timer is programmable and therefore perfect for planning ahead for a busy party up to 24 hours in advance. Or handy to set if you usually get a bit too immersed in your boxsets to notice the time. The manual covers all models so is a bit over-complicated. But because the actual build is clear and concise, operation is pretty self-explanatory. Stoves is a great and trusted kitchen brand and this nifty little induction range is a great example of how they do quality kitchen appliances with style. Simple, understated and efficient – this one is for the discerning kitchen appliance lover. This is a smart family induction range from Leisure which gives you the choice of two ovens and a grill cavity. It has a very generous oven capacity of over 120 litres, making it a great pick for ambitious cooks or busy homes. The interior catalytic lining is self-cleaning, so you don’t have to worry about constantly getting your hands dirty if you encounter spillages or smoking food. Just allow it to cool and give it a wipe. With such a fancy oven, you’ll probably have a lot of fancy extras such as pans and baking trays. Thankfully, the fourth cavity is a handy storage solution. The hob is really spacious, which is perfect if you have several large pans on the go for a big event and don’t want to prioritise certain things. As it is induction, it will heat the base of the pan rather than the surface of the hob. Cooking a large meal has never been more cost-efficient. It also looks lovely when in place in a kitchen, adding warmth and character to the room. With an overall black colour and stainless steel accents, modernity and classic design combines beautifully. This kitchen range looks stunning and with its generous oven capacity, it’s a great choice for busy family kitchens. Range cooking without the range cooking price. This unusual Rangemaster is a real treat for the eyes and whether you have a country kitchen or want to emulate one, it will certainly add character. Slightly bigger than some of the previous Rangemaster models at 100cm width, this solid multifunctional range is made out of stainless steel and covered in a choice of seven colours. Settle for stainless steel or black gloss to match your other appliances, or if you want to work with your other accents, China blue or cherry red are real standouts. A 5 burner hob will keep all of your pans boiling and frying to perfection, and there are two ovens and a grill on top of this. Automatic pan detection will let you get going straight away, and residual heat detection will tell you if the hob is still hot without you getting too close. When we say it is multifunctional it is no exaggeration, either. A fan setting will thoroughly roast your meat and bake your cottage pies. A defrost option will thaw your frozen meat when you forgot to leave it out. The grill will get you toasting and crisping in no time. It isn’t the most fancy or futuristic, but this model demonstrates that this can be a great thing. It is safe to say it won’t let you down. A lovely unusual looking kitchen range, this is another quality kitchen appliance from Rangemaster. Though it may be a little more expensive than some of the other brands reviewed, their machines do deliver on quality and longevity and are a solid investment. Chunky, vintage yet just as easy to use as the modern-looking options out there. This is a solid Rangemaster induction range cooker. We love this freestanding electric range for its classic silhouette, coupled with a contemporary induction cooktop. This is the sort of range we can imagine gracing farmhouses up and down the country, with kittens curled up in front in a basket or two. Time to put the apple crumble on we think. If aesthetics are important to you then there is a very wide choice to pick from. You can select one of five colours, then further select either chrome or brass accents. These accents are also superior quality, feeling strong and sturdy without being cumbersome. For anyone who is after a top-of-the-range cooker packed with features, all at around 90cm width, it is a solid choice that will match any kitchen. We loved everything about this range cooker! This Rangemaster induction model looks good and delivers on performance too. Bonus points for all the lovely shades, though we love the classic and easy to style black range that will look good anywhere. Dual fuel offers the classic combination of modern electric ovens topped with heritage gas burners. They are very popular, cost-effective, and tend to be the favoured range design on the market right now. Thanks to one fan oven and two conventional ovens, this Leisure range is incredibly generous in terms of space for anyone who finds themselves often cramming loads of trays into their oven for dinnertime. In total, there is 160L of space for you to fit your casseroles, cakes and chips. Preparing Sunday roast has never been so stress-free. There is also a separate grill, so if you have bacon, egg and chips for dinner, you don’t have to worry about keeping something warm. There are also five gas burners which are roomy enough to all be occupied at the same time. If you’re an adventurous cook, the wok burner and separate convection griddle area will be very welcome. There is a flame safety precaution in place, so if the flame goes out the gas supply will cut, and you won’t have a dangerous environment or accidental ignition. An interior light will help you see the progress, and catalytic liners within the ovens will assist you when it comes to the cleaning. Unfortunately, it is open door grilling, but as seeing you have a pretty full choice of cooking spaces, we’d say you can work around this if you wish. Because there are four chambers, they are a little narrow, so you may have to purchase a new set of baking trays if your current oven is full width. Be aware that they all cook at different speeds too, so get to grips with it before you get too adventurous. If you’re after the look and efficiency of a range cooker, but without the £1000+ price tag which commonly comes with them, then this Beko model is ideal. There are four cavities to choose from and a seven burner gas hob that is spacious enough for you to have several pans on the go. The main fan oven cooks everything evenly, so if you are baking a batch of biscuits and want them all even, you won’t be let down. The second cavity can act as an overflow oven but is perfectly capable of cooking food well on its own. Nano-cleaning technology keeps it looking as good as new, and the enamel pan supports are also easy to remove and keep clean using just hot water and soap. There is an automatic safety shut off feature which adds an element of protection if you are in a busy household, and you don’t have to worry if you aren’t on the mains gas as it is easy to convert to LPG. Manufactured in Leamington Spa, this Rangemaster is from a completely different kitchen design era. Crisp, modern and contemporary with clean edges and a sleek stainless steel finish, this professional Rangemaster ushers cooking into the 21st century. It is available in four colour choices – cream, cranberry, gloss black or stainless steel – so before you even get using it there is a big decision to make. Thankfully, they’re all fab colours so there will be one you fall in love with. Then you have the name. Professional. A lot to live up to, but it pulls it off. Six gas burners give you powerful results which you remain in control of at all times. You also get a griddle and wok burner, so your cooking prowess will never face any limitations ever again. Two side-by-side ovens let you juggle all of the meal components at once, or if you’re cooking for one, you don’t have to fire up the entire appliance. A separate grill lets you tackle your lunchtime cheese on toast with ease, and there is a storage drawer. Situated at the bottom right, you can either keep pans out of harms way or use it as a warming drawer for your plates and cutlery before serving. Super roomy and high quality this is an awesome model, giving you the perfect mix of modernity with a touch of retro. A beautiful, sleek Leisure cooker that is both durable and easy to use. This is a real great budget buy, giving you undeniable gas hob quality for a cheaper price. Featured is a 67 litre main gas oven and a 79 litre tall electric oven, which is the perfect solution who loves the possibility of both and can’t decide. All you need to do to clean it is wait for it to cool down then wipe. The oven liners burn off the food over 200 degrees, so all that is left behind is ash deposits. The only (small) downsides are the smaller than average mains gas oven, and the gas grill that just doesn’t have the power of some of its contemporaries. Despite these minute issues, it’s still a great kitchen appliance possibility, and the large electric oven should make up for the smaller one. After all, unless you have a huge household, you won’t need over 67L to make the dinner. Five gas burners give good accuracy and fast heat, with a wok burner to accommodate your curved stir frying pan. Cast iron supports will keep them all in place. All in all, if you’re after a 90cm wide oven which is deceptively generous in capacity, look no further. The Smeg Victoria’s are quirky 50s retro style cookers which would be a stylish addition to any family household. This product comes in both cream and black colours which would suit kitchens of all styles. This large, multifunctional oven boasts both grill and half grill functions, alongside conventional cooking which provides a second oven and grill compartment – ideal for cooking large meals with components requiring differing temperatures. There are six gas burner hobs, giving you plenty of space to cook almost anything you can imagine. With a hob featuring a staggering six gas burners, you have plenty of space to cook to your heart’s content. On top of this, the cooker features an ultra-rapid burner which is ideal for larger vessels. A tangential cooling fan allows for external surfaces to remain cool whilst you cook or grill, which serves as an additional safety feature to prevent any nasty accidents. Moreover, this cooker also features an eco-friendly cleaning system which means you can simply spray water or washing up liquid around the appliance, then wipe the dirt away almost instantly. On top of this, the oven has a side door opening system which gives you easy access to get closer to the oven, making it easy to check on your food. Telescopic shelves are a convenient addition, making it far easier and safer to slide out shelves to add or remove your food from the oven. This product is an ultra-stylish superstar in the cookers market. It’s a fantastic choice for any family home, if you can afford it! The Rangemaster Kitchener 90 Dual Fuel is a multi-functional cooker with a large capacity so you can cook different meals all at once. With a double oven, five gas burner hobs, a large wok burner and separate grills, these dual fuel cookers are practical for those with large families or who love to cook. This spacious design makes cooking enjoyable and gives you variety with meals. The Rangemaster Kitchener 90 Dual Fuel is fitted with a flame supervision device or FDS, ensuring safety at all times. This means that no gas will enter the oven when the appliance is switched off, preventing gas leaks and fires. The separate grill offers the chance to cook a wide array of different meals and gives more versatility in your cooking. This is a spacious cooker comprising of two separate ovens. The main oven is 69 litres while the second oven is 66 litres. Both ovens feature fan assisted cooking ensuring even and fast cooking. The main oven has a double glazed viewing window and in interior light, so you can keep track of your meals at all times. The catalytic self-cleaning liners made of hardy enamel, keep the interiors of the oven clean and dirt free, giving you more time to enjoy cooking. These are powerful and spacious cookers that is a great addition to any home. These are powerful and spacious cookers that offer flexibility while cooking. This oven is perfectly suited to those who love to cook. Another offering of stainless-steel from Smeg, but this time with a matte finish. With powerful versatility, the Smeg C92DX8 Dual Fuel compliments any home kitchen. A variety of different functions and programmes give you well-rounded cooking options and mean that your oven is always up for the task. From the respected Smeg brand, these cookers offer quality without compromising power. These cookers comprise of one multifunctional oven, one convection oven with two integrated, full-width grill, a programmable main oven and 6 gas burner hobs to cook a variety of different meals. The spacious oven offers flexibility and the main oven offers 27 litres and the second oven is 35 litres. The oven works on dual fuel offering flexibility and a variety of cooking options, making these cookers suited for a family home. The flame supervision device ensures safety while cooking and so is suitable for homes with children. The FSD ensures that no flames are left by accident and the gas will cut off if it’s left running and this will prevent gas leaks. Easy clean oven cavities ensures that grease, oil and food debris do not build up on the oven surface and makes it easier to clean. This leaves you more time to enjoy cooking instead of the gruelling task of cleaning. This easy clean interior means that your oven can stay looking brand new for longer. The Smeg C92DX8 Dual Fuel cookers a variety of different features, with a grill in both of the ovens and a minute minder to monitor food, you stay in control of your cooking. If you are looking for a sleek and powerful dual fuel appliance for your home then the Smeg C92DX8 cookers are a very good option. With amazing safety features, these cookers perfect for families with children. The Britannia freestanding cooker has a lot to offer. Two generous ovens, 6-burner gas hob with wok burner and an integrated grill make it one of the best high-end options available. We love the colour choices with this model. Black, cream, red and stainless steel are all classic. Yet, they give you the option of adding something a bit different to your kitchen. Under a deceptively simple exterior is a high-powered kitchen appliance that offers speed, flexibility and all the mod cons. Britannia products are known for their higher price tags, and this one is no exception. It is an appliance purchase for the dedicated and committed cook. However, it could probably also turn the most awful cooks into kitchen superstars, too. We especially applaud the oven functions this model comes with, including a pizza function. With a combined oven capacity of 80 L, this is perfect for people who love to prepare good roast. It would be perfectly cooked and timed to perfection. It is just a shame there aren’t more oven cavities, as that’s what people traditionally expect from cooking on a range. This freestanding model looks smart and has loads of great functions but it’s also at the top end of the market, not making it a kitchen appliance choice for everyone. A 110 cm cooker with generous cooking space, this Smeg is our favourite colourful cooker on the market. Perfect if you want to jazz up your cooking space or show off your bold personality through your appliances, with the option of pastel blue or pink. A gorgeous addition to any kitchen, the Smeg TR4110RO cookers offer quality combined with a fun retro design. Roomy and well-proportioned, it is a great family favourite. We especially love the vapour clean system and the odour-free closed door grilling. The last thing anybody wants is to be getting their hands dirty cleaning up or having a home that smells like burgers for days. It hosts four cavities, and the main multifunction oven comes with seven functions. The circulaire function, for instance, gets heat distributed throughout without having to wait for ages or keep turning the baking tray around. We also loved how the grill is two levels. Whether you want to slowly crisp a lasagne or quick-sizzle some bacon, just adjust to suit. There’s seven hob burners, two of which are rapid. The cast iron pan supports will keep things stable, and the programmer and timer function lets you get on with other things while it takes care of the monitoring. Pricey, but worth every penny. This option is pretty in pink – the perfect buy if you’ve got some more budget to play with. Create a cooking experience to remember with this Bertazzoni Professional Series Dual Fuel Twin cookers model. This professional-style oven ensures every meal is cooked to perfection. Offering immense space, these cookers combine different cooking styles with a double oven, grill and gas hob features for versatility. These professional series dual fuel twin cookers keep bills low with an A energy efficiency rating for the main and secondary oven. Both ovens are fitted with triple glazed doors so minimal heat is lost during cooking. The Bertazzoni Professional Series Dual Fuel Twin is available in a variety of different colours from orange, yellow, black and burgundy. This appliance is spacious offering a combined capacity of 138 litres so you can cook multiple meals at once. With different oven modes, you can cook a variety of different foods whether baking, warming, grilling, roasting or looking for convection cooking for your food. Both ovens have nine different cooking functions and even heat distribution to ensure every meal is cooked to perfection. This dual fuel twin appliance has six gas hobs including a dual wok burner for larger pots and pans, rapid, auxiliary and 3 semi rapid sizes so you can prepare multiple dishes at the same time. If you are looking for professional quality then then Bertazzoni Dual Fuel Twin Cookers is one of the best multifunctional ovens available. The Rangemaster dual fuel in Cranberry is by far our best professional option, for those who either cook on a large scale or need that little bit of extra quality in their cooking. This cranberry shade is absolutely divine – but it’s not all skin-deep with this model. Two 69 litre ovens, five gas burners and two ceramic hobs make this a hard-working kitchen appliance which will do most of the effort for you. This is an awesome cooker from Rangemaster who dominate the market thanks to their quality designs and gorgeous colours. Wow. This 90cm range cooker really is a steal! For a budget price, you still get all the freestanding features you’d expect. You’ll notice the difference in quality mainly in the materials selected (like using enamel instead of cast iron), but overall this choice offers a fantastic kitchen appliance for a brilliant price. And the design isn’t too shabby either! There are seven gas burners and a wok burner with flame supervision device. Both ovens rate A for energy efficiency and offer double glazed windows. The FLAVEL Milano is by far the best budget dual fuel option which we reviewed. Cheap dual fuel option that won’t be beaten on price. After something on the high-end side without being too in-your-face? With good looks and pure functionality, the Rangemaster Elise 110 cm Dual Fuel is powerful and well-equipped to handle the demands of cooking for the whole family. It boasts spacious oven cavities with six gas hob burners on top. It’s stunning and sleek design makes it perfect for any kitchen. Its bright cream exterior adds a splash of colour for your home and offers professional cooking power, whatever you are planning on cooking. These cookers offer 10 different shelf positions across its two large ovens making it easy to tailor to your cooking needs. It’s main oven has multifunctional settings so you can use fan assisted cooking or convection depending on the meal you are preparing. The solid door design seals in heat for even and efficient cooking. The interior of both ovens is coated in Catalytic liners for easy cleaning. These Catalytic liners soak up any grease and oil whilst you cook to keep your oven cleaner for longer. Overall, this option puts the joy into cooking a variety of meals and is perfect for those looking for quality and professional cooking equipment in their homes. The Rangemaster Elise 110cm Dual Fuel is powerful and offers quality while cooking a variety of different meals. This 90cm freestanding Smeg cooker offers both traditional quality & innovation. A brand often associated with more colourful retro appliances, this TR103 model from Smeg actually comes in cream and black gloss, which definitely makes it the best subtle, traditional design on the market. Great if you are after the ultra-modern look which still offers traditionalism and class. Smeg is renowned for its great kitchen appliances, and we love this glossy dual fuel cooker with three cooking cavities and loads of oven functions. Built to last with kitchen classiness at its core. This Smeg will bring joy to any accomplished cook. Brilliant option for a competitive price. The Leisure CS90F530 Cuisinemaster Dual Fuel Cookers are very stylish and sleek cookers to suit any kitchen. It comes in two different colours, classic stainless steel or the modern contemporary black design. This cooker comes equipped with two ovens, separate grill, five gas hobs and a wok burner for flexible cooking. The Leisure CS90F530 Cuisinemaster offers lots of space and comes with six metal shelves for both ovens. This oven offers unbeatable performance, without compromising quality or power. Whatever the size of your pots and pans, there will always be space with the five gas burner hobs. The wok burner is located in the centre of the hob and can accommodate any larger pots and pans with ease. Enjoy the traditional rustic cooking experience with the cast iron pan supports, making the oven feel like a traditional version. The double ovens provide an abundance of space and lots of flexible cooking options depending on the food you want to prepare. The main fan oven boasts 58 litres of cooking space and is perfect for cooking a variety of dishes. The fan ensures that heat is spread evenly through the oven and food is cooked to perfection every single time. This oven is lined with self-cleaning catalytic liners that reduce grease, oil and food build-up to make the job of maintenance even easier. Quickly wipe down surfaces when done to keep your cooker looking good as new. Keep track of your cooking times with the programmable timer installed on this cooker. Large windows on oven doors and the interior light means you can keep track of your cooking easily. If you are looking for a powerful and stylish looking option that won’t break the bank, then this is a great option for you. This Cannon by Hotpoint model has a great contemporary design that would look great in any kitchen. The brand worked with Jamie Oliver in the design process, so you know it is going to be a model for all the cooks who can whip up some magic. We love the easy to use gas hob that comes with six burners, for rapid yet in-control heating. A 3.5kw double crown wok burner means it has never been easier to prepare a stir fry, using your top-of-the-range curved wok which struggles on flat surfaces. Coming with over 120 litres of flexible cooking space, it is an appliance that won’t let you down when you need it the most. Gone are the days of juggling and warming up your food. Everything will fit in here. Speedy and of a high quality and finish – what more could you want from your appliance? There is a separate grill and warming space, which offers good flexibility. Both ovens are rated B for efficiency, which may not seem high, but for the size of the oven you’re not going to get much better. The stay-clean catalytic liners make the after-dinner clear ups easy, and all burners have flame safety cut-outs. For something with the control of a gas hob but power of electric cooking, it is a solid option. This is certainly a super option, even with the average energy efficiency rating. Still, it’s a fantastic dual fuel model that’s certainly worth a try and has been engineered with pro cooks in mind. Electric options combine heritage range design with the latest multi-function oven technology. These options often have a ceramic cooktop and one or two electric ovens – one being multi-function, the other conventional or fan-assisted. Many people prefer electric ovens as they are easier to control than gas, and can often give more consistent results. Everybody loves a bit of colour choice for some personalised appliances that can truly show off your creative flair. With this Bertazzoni model, you have seven to choose from. Bright yellow, anybody? Design isn’t all that this range cooker offers. There is a host of functions, from grilling to a rotisserie option. Air flow technology will get the heat just right no matter what you’re up to. Thanks to the 123L of space, you face absolutely no limitations. Bills will also stay low thanks to the A rated efficiency. Triple glazed doors keep the heat in, and also allow you to keep a beady eye on what’s cooking. Because there are two oven chambers and a separate grill, keeping everything in check and timed to perfection is easier than ever. The induction hob has pot detection so it can’t be turned on without there being something to cook in place. Plus, a residual heat indicator will tell you when you still need to keep your distance to prevent any nasty accidents. These range cookers are a fair bit pricier than some of the others we’ve featured, but it’s a stellar piece of kitchen kit. You can’t go wrong with this many great oven functions and a super energy efficient design, if you have the cash. This quality kitchen buy is for the discerning home cook who prefers their appliances professional and sturdy. Packed to the brim with loads of good oven features, this range cooker brings you all the latest in oven design. With two fan ovens and a spacious ceramic hob, this fully electric range cooker is a great option for any households wanting the most up to date appliances money can buy, while sticking to a budget. Yet, you can still keep the efficiency of an Aga. It comes with the luxury of three compartments just like most ranges, but the safety aspect of hot hob indicators and a catalytic liner in the main oven to oxidise dirt and reduce the build-up of grease. There is a timer to help you keep on top of all your cooking and baking without having to keep an eye on the clock. The dials are easy to turn, and the settings are all clearly marked, taking the guesswork out of the equation. Even though you can’t see inside the oven without opening the door, there is an interior light so you can check on the contents without pulling them out. The plastic knobs aren’t at the quality and strength that we’d hope for with a product of this quality, but as you’re grabbing a range oven for under £1000, we can live with it. You want a modern-looking kitchen but dread letting go of your current old-style Aga - this is a happy-medium. If you are after a range which looks the vintage and classic part, this is a great pick which still offers modernism. This beautiful cooker from Rangemaster offers a wonderfully retro and beautiful cooker design, paired with modern oven features. Plenty of functions will see you cooking everything, from basic pasta bakes to more creative dishes and sweet bakes. Choose from a fan or conventional option depending on what you’re baking, and you can thaw out the meat you forgot to bring out and defrost or that meal prep option which you keep in the freezer for those ‘late home from work’ nights. There is a six zone electric ceramic hob, which not only looks clean and sleek but also gives you quick heating times and a secure base for all your pots and pans. Both ovens feature 69L capacity, so you could make a roast dinner for the entire street to enjoy and still not have to juggle it all! The gloss black design makes this range the perfect addition to any family home, as it isn’t going to look out of place. It may be above a lot of budgets in terms of price, but if you’re willing to spend this much on an appliance which won’t only give you reliable results in the short-term but will become a fabulous investment in the long term, you can’t go wrong with it. We loved everything about this range! This range cooker is a real delight for the eyes from this classic British kitchen brand. We love the fact that you can adjust the height of the cooker (which is rare) and bonus points for all the little handy cooking features that make this range so easy to use. Classic electric range cooker from Leisure – top value for money and our best pick out of all of the electric range cookers which we reviewed. This Leisure electric range cooker is a great kitchen buy. Low on price, high on quality, this is a range cooker that will keep on pleasing with its even bake and stylish exterior. Perfect for those who are put off by the idea that a range cooker has to be gas. This range cooker doesn’t break the bank, yet it delivers on style and usability. We love the fact that it delivers an even bake and is quiet too. Solid electric range cookers from Leisure, perfect for leisurely cooking. This one doesn’t quite have the personality that some of the other range cookers do in terms of design, but this Candy electric range is a quality buy for those who like its simple stainless steel features. A five zone ceramic hob gives you plenty of space to get everything going, so if you are frying a steak while boiling rice and vegetables in two other pans you won’t have to juggle it all to fit. There are two oven chambers as well, and the main one not only offers six cooking functions but also can be timed to come on when you need it to. If you know you won’t get back from work until late, why not have your casserole bubbling away when you get in? The second oven works alongside it well, and offers yet another grill. Most range ovens only have one grill, so this is a real treat. Easy clean enamel can’t prevent spills and splashes, but can make them easy to wipe away. Inconspicuous and inoffensive, this Candy delivers in capacity and usability and is great for people who’d rather not go for the retro range look in their kitchen. Gas versions are seen as the classic option – they have gas burners (hobs) as well as gas ovens. Gas ovens can be temperamental and some people don’t like them because of their temperature fluctuations. Others find that cooking with gas ovens keeps food more moist and tasty. Generally, gas hobs are seen as easy to use and safe; they are especially needed for they type of fast cooking favoured in Asian cuisine. (Incidentally, gas models often have a wok burner). Featuring an ultra-responsive gas burner with 6 zones, including a wok burner, this Hotpoint model is the perfect mix between classic country range and modern 21st-century offering. Both ovens are just over 60L each, which is plenty of room for any household no matter how large. They have lights inside, so you can always see what you are doing and how the cooking is coming along. There is a separate variable grill which makes catering for smaller numbers or using both at the same time much easier, and a storage compartment to keep your plates warm before serving. It all comes with a griddle pan which you can use on top of the hob too, perfect for any frying which requires a lot of attention. The only slight problem anyone may encounter is that the electrical cable is quite short, which could be problematic if you don’t have a dedicated socket for your oven. Bear this in mind if you are wondering about placement. This British Rangemaster is a testament to classic kitchen design and it delivers on so many levels. Stylish, powerful and practical, this model includes all the lovely little features you would expect from a quality kitchen appliance. First up is the big six burner hob which will fit all your pots and pans comfortably, and there’s also a griddle and wok burner if you’d like to extend your culinary delights. Both ovens are 81L, which quite frankly is more than we think most will ever need but still fabulous to have to hand. If you’ve ever struggled fitting the turkey in the oven at Christmas, why not prepare ahead and invest in this oven? The main oven is programmable. Simply put, you can time it to start up at an exact time. Say you’re entertaining and want to wow your guests without even entering the kitchen. Or maybe you’re the type to plan ahead and get dinner ready for when you get home from work. Checking on the food is easy too thanks to the porthole window glass. You also have a Handyrack which slots onto the door and pivots out when you open it, so you can check on roasts with no effort at all. A timer will alert you to when the food is done without risking overdoing it. A drawer gives you space to store all your cutlery, and the catalytic oven liners make cleaning easy. We loved how easy it was to use, and would welcome it into our own kitchens with open arms. It’s hard to find fault with this beautiful gas model that offers a huge amount of space and style. Cook up a storm for the entire household with this multi-faceted kitchen essential. This black cooker displays a stunning style and plenty of much-needed features. It includes a grill, hobs, an oven and a very handy storage compartment to host your cookware. The spacious product is one for a bigger kitchen and has the competencies to cater for larger families and although it has many uses it is one that’s simple to utilise. What has this reliable cooker got in store for us? It has an electric fan oven, seven burners and a capacity of up to 64 litres cementing its place as one of the main contenders for your kitchen. There’s enough faculty available to prepare an entire meal and more, there are seven gas hob burners making it an effortless task to cook multiple vegetables at once and you can also use the oven to prepare the roasted aspect to any meal too. If you’re serious about the aesthetic and practical elements of your cooking haven then you will look to add this to your artillery. With a smooth black build, numerous compartments and digital display, it is a gorgeous addition. What’s more, it’s also one of the most reliable appliances on the market – this is a must for those with a big kitchen and a lot of cooking to do! The perfect appliance for a big family. Enjoy professional cooking and classic style with the Belling Gourmet 90G Professional Gas with stainless steel finish. This oven is spacious and can easily handle preparing many dishes at once. With one gas oven, one electric oven, separate grill space and five gas hobs with a wok burner, the Belling Gourmet professional oven is a great addition to any busy home. The tall fan oven on the right hand side boasts 91 litres of cooking space with multiple shelves to cook a wide array of meals. The fan ensures food is cooked evenly and cooked to perfection every time. The first oven is a conventional gas oven, offering 64 litres of space with two shelves. This oven is perfect for cooking more traditional dishes like baking and roasting food. The gas hobs work instantly and rings vary in size depending on the pot or pan you wish to use. The central wok feature allows you to make a stir fry in minutes and is suited to larger pans. The hobs offer versatility so you can slow cook a stew or quick fry an omelette. The separate grill gives you even more cooking options and allows for healthier cooking without the use of oil or butter. The grill is variable and so can be altered depending on what you are cooking and portion size. Overall, this is a great professional style cooker with multiple functions depending on what meal you are preparing. This is a classic, chic and versatile oven suited to those looking for professional quality. Cook a variety of different meals for the ultimate cooking experience. Some freestanding cookers are styled as ‘mini-ranges’, imitating the classic range design on a smaller scale. This is perfect for anyone who loves the benefits of this form of cooker, but who doesn’t have the space or width available in their kitchen. For a budget mini range, this Flavel model really does have it all. With two ovens and even a separate grill, it’s possible to cook like you would on a full size range, without it taking up so much space. Five gas burner hobs ensure that there is plenty of cooking space on top, and with the two ovens offering 79 and 58 litre capacities, you don’t lose out on oven space. With easy clean enamel interiors, all of the cavities are really easy to clean, saving your time for the things that matter the most. One of the most impressive features of this model is the flame supervision device, making sure that if the flame is extinguished on any of the hob rings, the gas will immediately stop in order to protect you and your family. The perfect choice for a family that want the benefit of a full range cooker, without the hefty price tag or large size. This freestanding dual fuel cooker is a compact and sleek design that is perfect for those that want the look of a classic model but do not have the space for one. The Stoves Richmond 550DFW is a powerful oven with a variety of cooking functions and programmes. It boasts two large oven cavities, an integrated grill and four gas burners on the top. The main oven cavity is spacious offering 59 litres of cooking space. It operates as a fan oven ensuring that food cooks evenly wherever it’s placed in the oven. The second oven cavity is smaller at 39 litres and uses a conventional heating system to cook a variety of different meals. The grill is spacious and can be used simultaneously while baking or roasting in the oven. This oven offers four cast iron gas burners which can be used for a variety of different meals. The hob boasts a 4 kW wok burner which is perfect for cooking stir-fry or to use for larger pots and pans. The four gas burners also feature a flame failure device ensuring safe cooking at all times. Overall, this stove is a compact and powerful appliance that offers fast and even cooking. Though this oven is compact, it has lots of internal space and ensures perfect cooking quality every time. The ability to have a range cooker compacted into the size of a normal cooker is a pretty revolutionary design result, and this Leisure cooker ticks all of the boxes. It has the retro country kitchen styling we all know and love, with two separate ovens and a four burner hob. You get a main fan oven which has a capacity of 75L, and will help airflow and even cooking while giving you energy-efficient results (fan ovens can run at lower temperatures). The second oven is a handy 38L, making it a perfect accompaniment. It is conventional so best for baked goods, but there is a grill option too. Full width, this will get you cooking bacon in a flash. A double glazed door means little heat is lost. Catalytic liners switch the grime to ash so it is easy to wipe away. The digital clock and programmable timer make cooking simple and efficient. What more could a home cook want? This is a really great mini-range that always performs well in user tests. We love its cream or black exterior and retro kitchen feel. Compact, small and well-priced, this freestanding model is the perfect bijou kitchen appliance. For those who want the style of a kitchen range, without one that will hog all the kitchen space. This option is good value for money and it looks good in any classy kitchen. We love it and despite a few niggles we discovered when in use; it’s still a great quality stove for any kitchen. A great mini electric stove that has been designed and manufactured in the UK. It has everything you could want from a range cooker, without taking up every available inch of space in your kitchen. It should slot into the tightest of spaces, at just 55cm wide. Yet, a combined capacity of 108L will never leave you short on room. The 4-zone ceramic hob gives you the space you need for boiling all the vegetables for your Sunday roast. There’s also an electric fan in the main oven, and an electric grill with conventional electric oven cooking in the top compartment. A perfect balance. As it is electric, the vast majority of homes will be able to fit it without any complicated piping or switching to gas. We loved the lid which fits comfortably over the hob when it isn’t in use. Twin side lights are in place for optimum illumination inside, so you can keep a watch over the process. Bonus points for the lovely oven shades, too. Our favourite would have to be the Jalapeño red. Quality kitchen design at its best. Tucked underneath a lovely cast lid, this fiery stove is a small and compact range cooker. It’s lovely classic design is complemented by the colourful exterior. Perfect for people looking for that special country kitchen look on a budget. Great for those who love cooking with gas (and who doesn’t love the speed and authenticity of gas cooking?) It doesn’t just stop at the hob though, as the cooking chambers are also fueled this way. Hidden beneath its sleek glass top lies the four gas burners. Push button ignition makes them simple to get going, and all is Flame Supervision Device compliant. When the lid is closed, it isn’t possible to turn the gas on. Fab for busy, safety-conscious homes. The first cavity is 69L and second 39L, which is great for large and small meals alike, and both can be used at the same time. Halogen lighting illuminates your food so you can see it without opening the door, and both bulbs give off a third more light using 20% energy. Quite a beneficial balance for your wallet. An electric grill will crisp up your baked dishes and bacon in the top chamber. Bonus points for the great oven design with nice, big windows so that you can check up on your food easily. A programmable digital display timer will ensure you don’t overdo any of your dinner if your mind is elsewhere. Plus, the enamel coating keeps things clean and any burnt food can be wiped away once it all cools down. Overall, it is robust, and well priced to offer the user a perfect balance of quality and a budget-friendly cost. Stoves are best known for quality, and this one is no exception. Compact and well-designed, it packs a whole load of useful oven features into a small space. This is a great purchase for the quality-conscious cook who loves cooking with gas. Jazz up your kitchen with this cream and chrome classic mini cookers from Curry’s. Get all of the functionality and versatility of dual fuel cookers, in a smaller package. It still offers vast amounts of cooking space and will fit into smaller kitchens. This model does not include a splash back, but what it loses in this feature it makes up in overall quality and value for money. This mini model has two conventional gas ovens, a grill and four gas burners including a wok burner for bigger pots and pans. The main oven comes with two metal shelves to separate food in the oven. The glass window means you can keep an eye on your food while it’s cooking. It’s a decent size with a capacity of 41 litres. The second oven comes in smaller than the main one, with a capacity of around 17 litres. Cooking is easily controlled using the beautifully designed rotary dials located on the front of the cooker. Though this cooker is smaller than the usual Rangemaster, it doesn’t compromise on functionality, offering lots of nifty programmes and features to enjoy. The top (second) oven is a combined gas oven with integrated grill. This oven can handle a load of different cooking features like slow cook, crisp and defrost. The main oven is also a gas oven and offers a variety of different cooking programmes. This oven takes minimal maintenance thanks to the catalytic liners and chrome-plated ladders which ensure that oil and food debris don’t build up on the oven. This oven also comes with an interior light and timer, to keep you in full control of your cooking. The Rangemaster Classic is a great cooker offering functionality and power in a compact appliance. The colours suit well into any kitchen and this cooker is great for any family home. Buying a range cooker is a major kitchen investment, but most people find that they get more value out of their range cookers than they ever did out of their normal size freestanding cookers. Within a relatively compact kitchen space, ranges offer loads of versatile cooking space. Because they can have up to seven hob burners and four or five ovens/grills, they are perfect for large families or keen home cooks. Cooking on a range is a great experience, and people tend to get very attached to their appliance. These stoves carry a sense of nostalgia and harp back to the days of cooking in large farmhouse kitchens. Often stoves got passed down through the family; ranges try to keep that family tradition alive. Nowadays, range cookers can be ultra-modern, perfectly farmhouse or funky and retro. Other than traditional British gas models, you can get them with induction cooktops using the latest multifunction oven technology. Traditionally, range colours came in shades of black, cream and red, but now you can get them in pretty much all the shades (including pink and bright orange). These appliances can offer a fantastic set of extra useful features like storage cupboards, slow cooking ovens and warming plates that normal cookers simply cannot provide. You may even have a dedicated pizza setting for extra crisp bases. As freestanding range cookers are larger than cookers or ovens, they are best suited to larger kitchens, though there are mini range cookers on the market now for people who prefer compact packages. Range cookers are large kitchen stoves, echoing earlier kitchen times when cooking was done on large, heavy stoves. Range cookers are larger than a normal freestanding cooker and often have a retro or heritage design. Generally, normal size range cookers retail around the £1,000 – 2,000 mark, but retro luxury cookers can be considerably more. Budget models start at about £500, but you may immediately notice a difference in the quality of the finish and the materials. Kitchen appliances like these don’t tend to come cheap. There are generally four range cooker widths available. The mini options stand at around 60cm wide, which is around the size of an ordinary cooker. The smallest standard is 90cm, then there are also 100cm and 110cm options. Some even now come in at 12ocm or 150cm, which are on the commercial side of the scale but have been adapted for home use. What Are The Benefits Of Range Cookers? The main benefits of using a range cooker are increased oven and cooking capacity, and a more flexible and versatile approach to cooking. Rather than having one or two cavities and four hobs, a range cooker offers a much more diverse and exciting cooking environment. With a range cooker, you could have two to three different kinds of ovens and grills, and seven burners to work with. Range cookers often look smarter and have more perceived (and real) value than other cookers on the market. Advanced cooking functions: rotisserie, slow cooking, browning etc. Range cookers can be complicated to fit because of the their size and the way that they use fuels. Make sure yours is fitted by a proper installation engineer. Keep your range cooker healthy and prolong its life by regularly cleaning the hobs and ovens. Range cookers tend to last longer than ovens and regular cookers; they tend to be treasured appliances that people are proud to show off.